Suara Sarawak: No More Timber Concessions, Palm Oil Plantations Or Corruption – SR/RFS Welcome To Sarawak? No More Timber Concessions, Palm Oil Plantations Or Corruption – SR/RFS Welcome To Sarawak? 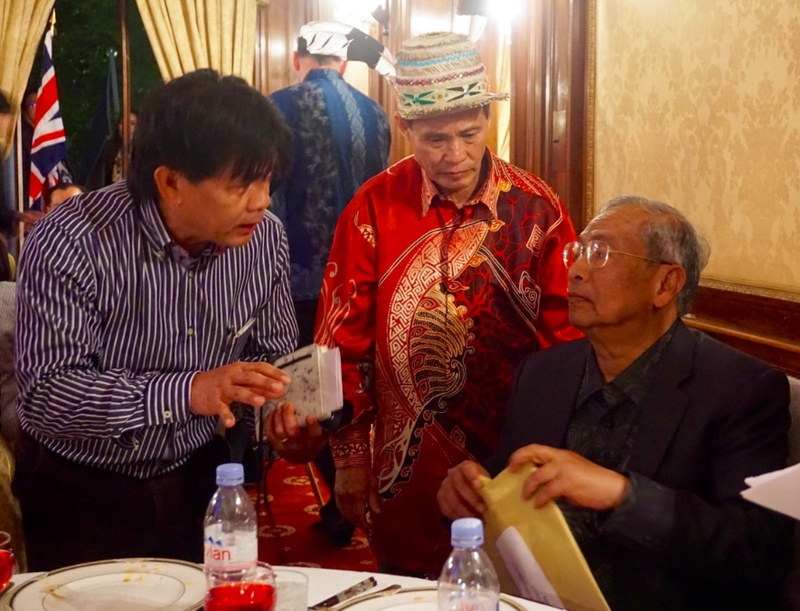 Sarawak’s Chief Minister astonished and wooed London listeners at the High Commission in leafy Belgrave Square last night, with a broad brush delivery on his major mood change over policy. When it came down to specifics, this veteran of a very different style of government was largely defensive and unwilling to be pinned to commitments. However, there could be no doubt that this was an attempt to reach out to his administration’s foreign critics on the environment and human rights and by and large the message was that he agreed with them – it was time for change. “I felt he took all my arguments” said a flabbergasted Mutang Yurud, a Kelabit who spent time in jail for protesting against logging in the 1980s, “suddenly the power-that-be is agreeing with all I have been saying. He disarmed me and if it is true this has to be real progress”. Particularly delighted was a small delegation of Penan, who had seized on the opportunity to present the Chief Minister with their Peace Park proposal for saving an area of Upper Baram, where they have been fighting off the loggers for decades. They had had the good fortune to find themselves sitting next to Sarawak’s Director of Forests, Sapuan Ahmad during the evening and presented not only him but Adenan with a copy of their blueprint for a tourist attraction and environmental heritage site. The Chief Minister responded that he was positive towards this and other such proposals, where they could be implemented practicably and without discord. Previously, this plan had been rejected for years and it created a wave of hope that something could at last be done to change the relentless destruction of Sarawak’s natural and cultural heritage, amongst an audience full of native connections with the state. On the other hand, there was no shortage of scepticism on the eve of a state election over a speech delivered by one of the key warhorses of the four decades old regime. Adenan is intimately tied to the network of politically connected family monopolies, which have sucked Sarawak’s wealth and given precious little back. The same crony conglomerates still control the state’s major concessions and economic opportunities. Adenan was talking in London primarily to draw the claws of NGOs, whom he implied have unfairly given Sarawak and its products a bad name internationally. It has rebounded on the ruling party’s self-confidence and Taib has called such critics “enemies of the state”. Adenan dealt with the criticism differently. He said he wanted to secure their help to change the way things are done in Sarawak and he made no bones about distancing himself from his predecessor. Re-cycling some jokes that Sarawakians have already flavoured at the expense of the present Governor, Adenan made clear he welcomes no slavish behaviour from his compatriots. And while he admitted that it had taken him a while to get used to it himself, he stressed he is now in charge. Describing himself as an environmentalist from an early age and someone who loved Sarawak’s forests, he echoed former PM Dr Mahathir in saying the logging must “stop” and the dam building programme needs to be re-thought. “One: No more timber concessions. Enough is enough… I love the forest and greenery. I do not see it just as a source of timber concessions. These were dramatic, bold statements and they represent a devastating sea-change on his predecessor’s stance, simply and uncompromisingly delivered. Although qualifications on the detail could well come later, this Chief Minister cannot get away from the new principles he is now signed up to. And there was plenty more, as Adenan patted himself on the back for measures to reduce energy bills and remove road and river tolls, which have been enormously popular measures locally. Sarawak’s intolerance of intolerance in matters of religion were also brought in to laughter. Then Adenan detailed some of his moves to clean up the Forestry Department and tackle illegal logging, saying that he was anxious to engage with NGOs to get more support and advice. At which point he highlighted the current ban laid against the Editor of Sarawak Report and Radio Free Sarawak, who had joined the audience to evident concern of some of the Embassy staff. “I learn that Clare Brown is here with us and I want to say I have no problem with that and she is welcome” he said, to some applause, having made clear that the ban exerted by Taib against her visiting Sarawak should be considered lifted. The audience at this event and the follow-up meeting for NGOs the following day were left in no doubt that Adenan Satem has delivered a volte face and a complete change of manifesto to the Sarawak people, who have been used to decades of logging and land grabs by BN in the name of ‘progress and development’. More pressing still is the need to pin down the detail on these broad commitments, at a time when departments of state are in fact still committed to expanding palm oil and driving through SCORE. There are some new faces surrounding the new Chief Minister, but plenty of the old guard too. As just one example, the major logger Len Talif Salleh now presides as a Minister of the Environment trumpeting his supposed record on Orang Utan survival. If Adenan wants to build real trust actions must swiftly follow words.